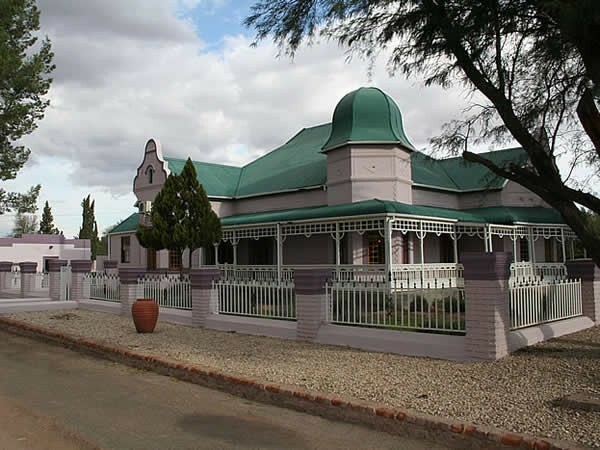 Situated in the Camdeboo Plains against the backdrop of the Camdeboo Mountains on the N9 between Graaff Reinet and the Garden Route, Aberdeen offers history for the mind and peace for the soul. 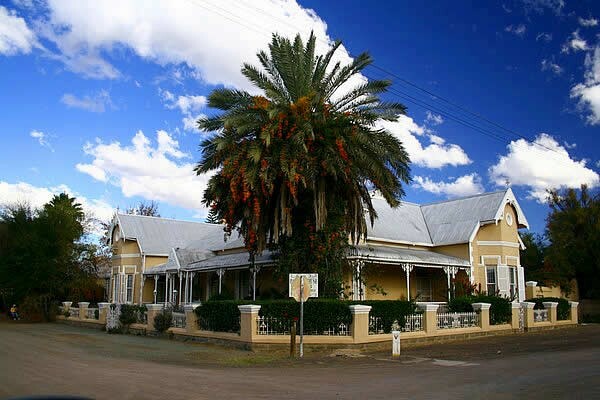 The district is renowned for its wool and mohair, being the largest mohair producing area in South Africa. The town has an extremely healthy climate, a restful and rural atmosphere, unpolluted air and unequalled starry night skies. Strolling through this historic town one is able to discover its rich heritage. Today Aberdeen is a town attracting many newcomers, some of them refugees from the big cities! With the healthy climate and the slow pace of life, the town presents a relaxing panacea for the stresses and strains of modern life. Numerous artists have settled here including Carlos de Souza, whose intricately decoupage ostrich eggs have found a home throughout the world. Various other crafters have workshops that may be viewed by appointment. 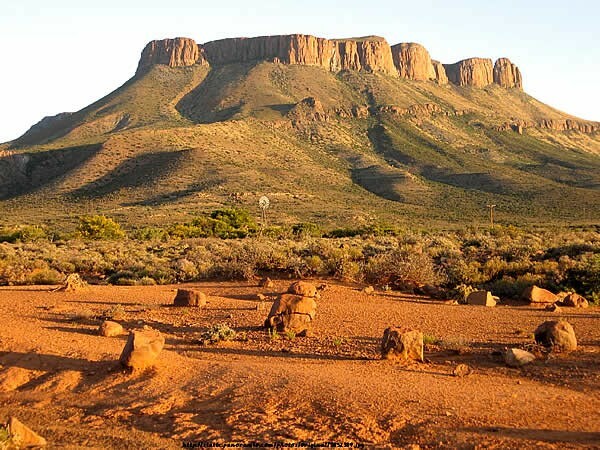 Annual rainfall totals 260 mm, with the plains being hot in summer, and the mountain areas relatively cool throughout the year. 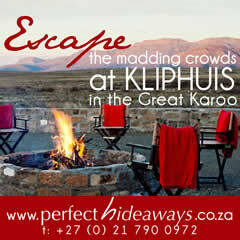 During mid-winter snow occurs regularly on the peaks of the Nuweveld Mountains. Pack cool clothing for summer and warm for winter – the region is subject to sudden changes in weather, particularly in the mountain areas. Remember to bring a hat, walking shoes, sun block, camera, binoculars and bird and mammal reference books. Hikers on day trails should always carry sufficient water with them. Has a Perennial spring, a Dinosaur footprint. Birdlife and game includes Springbok, Kudu, Steenbok etc. There are several hiking trails in the reserve and the Camdeboo Mountains, and you can also visit a meteorite site and a petrified forest on nearby farms. 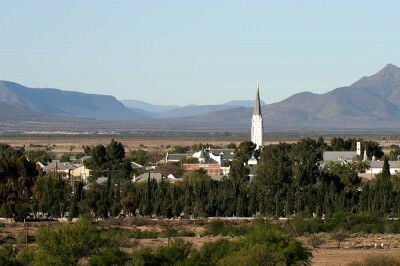 Off the N9 between Graaff-Reinet and Aberdeen lies the “green valley”. One can bathe in the shadow of towering mountains, hear the sound of water flowing everywhere and be blessed with forests of trees and uncountable smaller plants. Come and join in all the various eco-friendly activities we offer or experience the peace and tranquillity which comes naturally as you enter the Conservancy. Whether you partake in the day to day farming activities or delight in a horse ride, you are guaranteed to experience the restoration of your soul. Take a drive to the nearby Camdeboo Mountains for majestic views; visit farms for teas and lunches. Originally a farm called Brakkefontein, the deeds to the land were signed by Lord Charles Somerset, governor at the Cape, in 1817. The town of Aberdeen was founded in 1856 and named after the birthplace of the Reverend Andrew Murray in Scotland. The well kept cemetery is of special interest to historians. 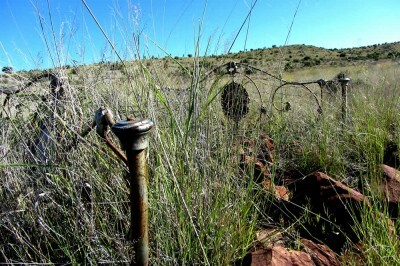 Many of the soldiers, both British and Boer, who lost their lives during the Anglo Boer War are buried here. British graves are numbered and the cemetery is open to the public. Aberdeen is a declared architectural conservation town and a veritable repository of styles incuding Victorian, Georgian, Karoo, German, Gothic Revival, Russian, Art Nouveau and Flemish Revival. Excellent examples of the ostrich baron dwellings can be seen. 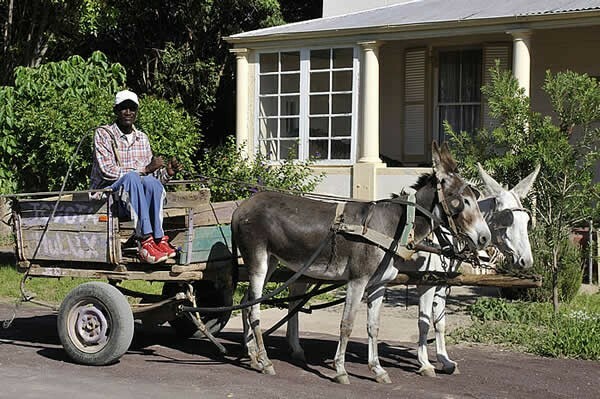 Walking tours of the town can be arranged. 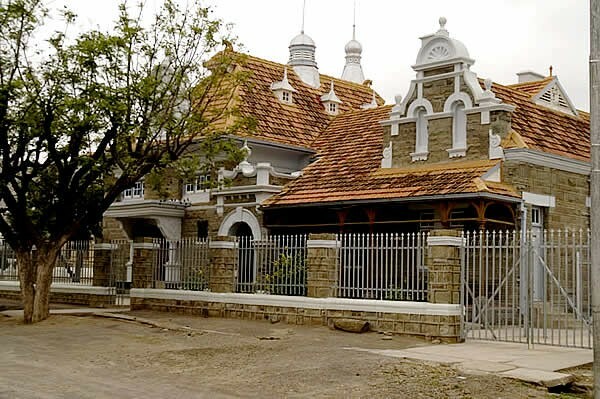 Many of the houses are richly decorated and intricately designed with domes, gables, turrets, ‘broekie lace’ and plaster motifs. A few still sport the once fashionable conservatories constructed of wooden and iron fretwork with richly hued coloured glass. 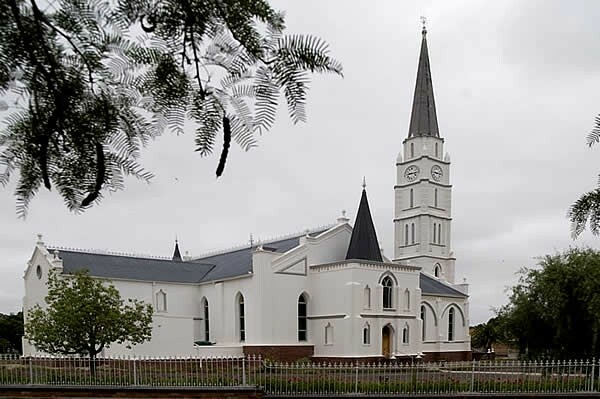 Of special interest is the Dutch Reformed Church – the 50m tower is claimed to be the highest in South Africa, but it is 18 inches out of true due to the weight of the roof tiles – ‘The Leaning Tower of Aberdeen’. The huge olive tree in the church garden originates from the Garden of Gethsemane. It was planted in 1980 to commemorate the church's 125th anniversary having been one of seven cuttings brought to South Africa by Dr Marais of the Institute of Fruit Technology at the request of an Israeli horticulturalist trying to save the dying olive trees in Jerusalem. The other cuttings are presently untraced. A unique collection of biblical wall hangings covers the walls of the church hall and guided tours are available by appointment during the day. Aberdeen cemetery, of all places, contains two graves having the name Rex, a name more usually associated with Knysna. Legend has it that the future King George III had an affair (or even a clandestine, morganatic marriage) with a Hannah Lightfoot by whom he was supposed to have had two sons and one daughter. 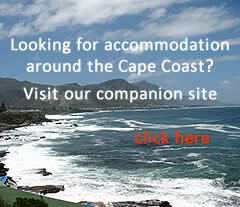 The story has it that the George Rex associated with Knysna and who came to the Cape in 1775 was one of these sons. He had a family of his own and some of his descendants later moved to Aberdeen. Thus Mortimer Frederick Rex might be descended from George Rex and thus might be of Royal descent. Interestingly, Frederick is also a name that ran in the Hanoverian dynasty; George III's father was Frederick, Prince of Wales. So, who knows?